HP iQuote now supports a variety of Number formats to support our International user community. Initially four number formats are offered but if new number formats are required they can be added. 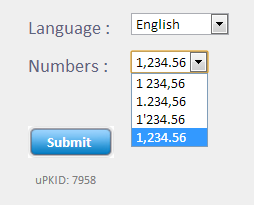 A nice element of this new feature is that the number format can be set at USER level but there can also be a COUNTRY default. The user setting can be found under Account Settings or Language Preferences. See the graphic below for number formats. Any feedback on this new feature or anything else use the Feedback Form within HP iQuote.